Ask the average person on the street, and he or she might guess that the first mammals didn't appear on the scene until after the dinosaurs went extinct 65 million years ago, and, moreover, that the last dinosaurs evolved into the first mammals. The truth, though, is very different. In fact, the first mammals evolved from a population of vertebrates called therapsids (mammal-like reptiles) at the end of the Triassic period and coexisted with dinosaurs throughout the Mesozoic Era. But part of this folktale has a grain of truth. It was only after the dinosaurs went kaput that mammals were able to evolve beyond their tiny, quivering, mouselike forms into the widely specialized species that populate the world today. These popular misconceptions about the mammals of the Mesozoic Era are easy to explain. Scientifically speaking, dinosaurs tended to be very, very big and early mammals tended to be very, very small. 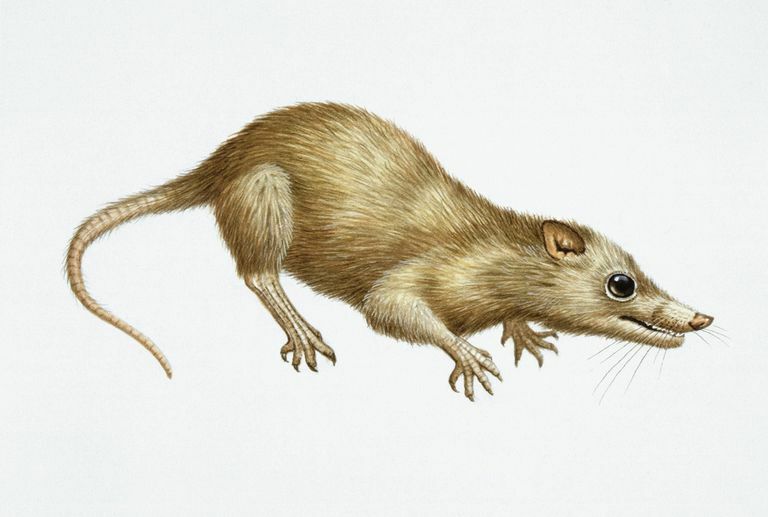 With a couple of exceptions, the first mammals were tiny, inoffensive creatures, rarely more than a few inches long and a few ounces in weight, about on a par with modern shrews. Thanks to their low profiles, these hard-to-see critters could feed on insects and small reptiles (which bigger ​raptors and tyrannosaurs tended to ignore), and they could also scurry up trees or dig into burrows to avoid getting stomped on by larger ornithopods and sauropods. Before discussing how the first mammals evolved, it's helpful to define what distinguishes mammals from other animals, especially reptiles. Female mammals possess milk-producing mammary glands with which they suckle their young. 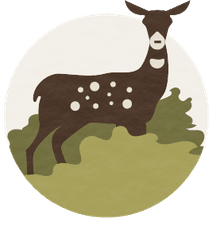 All mammals have hair or fur during at least some stage of their life cycles, and all are endowed with warm-blooded (endothermic) metabolisms. Regarding the fossil record, paleontologists can distinguish ancestral mammals from ancestral reptiles by the shape of their skull and neck bones, as well as the presence, in mammals, of two small bones in the inner ear (in reptiles, these bones constitute part of the jaw). As mentioned above, the first mammals evolved toward the end of the Triassic period from a population of therapsids, the "mammal-like reptiles" that arose in the early Permian period and produced such uncannily mammal-like beasts as Thrinaxodon and Cynognathus. By the time they went extinct in the mid-Jurassic period, some therapsids had evolved proto-mammalian traits (fur, cold noses, warm-blooded metabolisms, and possibly even live birth) that were further elaborated upon by their descendants of the later Mesozoic Era. As you can imagine, paleontologists have a hard time distinguishing between the last, highly evolved therapsids and the first, newly evolved mammals. Late Triassic vertebrates like Eozostrodon, Megazostrodon and Sinoconodon appear to have been intermediate "missing links" between therapsids and mammals, and even in the early Jurassic period, Oligokyphus possessed reptilian ear and jaw bones at the same time as it showed every other sign (rat-like teeth, the habit of suckling its young) of being a mammal. If this seems confusing, bear in mind that the modern-day platypus is classified as a mammal, even though it lays reptilian, soft-shelled eggs rather than giving birth to live young! The most distinctive thing about the mammals of the Mesozoic Era is how small they were. Although some of their therapsid ancestors attained respectable sizes. For example, the late Permian Biarmosuchus was about the size of a large dog. Very few early mammals were larger than mice, for a simple reason: dinosaurs had already become the dominant terrestrial animals on earth. The only ecological niches open to the first mammals entailed a) feeding on plants, insects and small lizards, b) hunting at night (when predatory dinosaurs were less active), and c) living high up in trees or underground, in burrows. Eomaia, from the early Cretaceous period, and Cimolestes, from the late Cretaceous period, were fairly typical in this regard. This isn't to say that all early mammals pursued identical lifestyles. For example, the North American Fruitafossor possessed a pointed snout and mole-like claws, which it used to dig for insects. And, the late Jurassic Castorocauda was built for a semi-marine lifestyle, with its long, beaver-like tail and hydrodynamic arms and legs. Perhaps the most spectacular deviation from the basic Mesozoic mammalian body plan was Repenomamus, a three-foot-long, 25-pound carnivore that is the only mammal known to have fed on dinosaurs (a fossilized specimen of Repenomamus has been found with the remains of a Psittacosaurus in its stomach). Recently, paleontologists discovered conclusive fossil evidence for the first important split in the mammal family tree, the one between placental and marsupial mammals. Technically, the first, marsupial-like mammals of the late Triassic period are known as metatherians. From these evolved the eutherians, which later branched off into placental mammals. The type specimen of Juramaia, the "Jurassic mother," dates to about 160 million years ago, and demonstrates that the metatherian/eutherian split occurred at least 35 million years before scientists had previously estimated. Ironically, the same characteristics that helped mammals maintain a low profile during the Mesozoic Era also allowed them to survive the K/T Extinction Event that doomed the dinosaurs. As we now know, that giant meteor impact 65 million years ago produced a kind of "nuclear winter," destroying most of the vegetation that sustained the herbivorous dinosaurs, which themselves sustained the carnivorous dinosaurs that preyed on them. Because of their tiny size, early mammals could survive on much less food, and their fur coats (and warm-blooded metabolisms) helped keep them warm in an age of plunging global temperatures. With the dinosaurs out of the way, the Cenozoic Era was an object lesson in convergent evolution: mammals were free to radiate into open ecological niches, in many cases taking on the general "shape" of their dinosaur predecessors. Giraffes, as you may have noticed, are eerily similar in body plan to ancient sauropods like Brachiosaurus, and other mammalian megafauna pursued similar evolutionary paths. Most important, from our perspective, early primates like Purgatorius were free to multiply, populating the branch of the evolutionary tree that led eventually to modern humans.